CORNER BROOK, N.L. 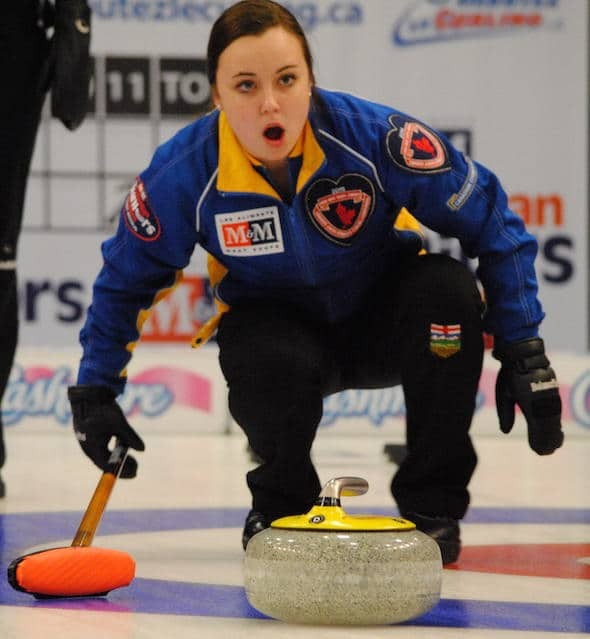 — Kelsey Rocque finds herself on the verge of history at the 2015 M&M Meat Shops Canadian Junior Curling Championships. 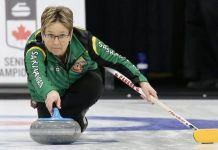 The 20-year-old University of Alberta student from Edmonton has nailed down a berth in Saturday’s women’s gold-medal game at the Corner Brook Civic Centre, where she will take aim at becoming just the fourth skip in the event’s history to win back-to-back titles. 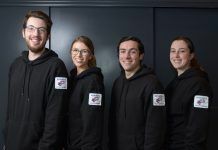 And should she do that, she’d also have the chance to join Scotland’s Eve Muirhead as the only skips to repeat as gold-medallist at the World Junior Championships. That Rocque is unbeaten in this experienced field is remarkable enough; that she’s doing it with a completely different lineup (third Danielle Schmiemann, second Holly Jamieson and lead Jessica Iles replaced Keely Brown, Taylor McDonald and Claire Tully after their junior eligibility was exhausted) than the one she prevailed with a year ago in Liverpool, N.S., takes it to another level, said team coach Amanda-Dawn Coderre. Alberta will close out round-robin play on Friday morning against New Brunswick’s Justine Comeau (Fredericton; 5-4) before starting preparations for Saturday’s gold-medal game at 8 p.m. on TSN/RDS2 (all times NST; EST plus 90 minutes). Rocque (third cousin to four-time Brier champ Marcel Rocque) is bidding to join Cathy King (1977, 1978), Suzanne Birt (2001, 2002) and Kaitlyn Lawes (2008, 2009) as back-to-back winning skips. “I’m definitely aware of it, but that’s not really in the picture right now,” said Rocque with a smile. 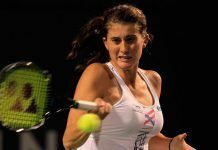 “I just want to win it for the three girls in front of me and our coach. To see them put on the Maple Leaf would just be incredible. In other women’s action, Saskatchewan’s Kristen Streifel (Saskatoon; 5-4) hit for three in the 10th end for a 8-7 win over Quebec’s Émilia Gagné (Jonquiére/Alma; 4-5), while New Brunswick took an extra end to beat Ontario’s Chelsea Brandwood (Hamilton; 6-3) 9-7. 2013 champion Corryn Brown of B.C. (Kamloops; 7-3) has locked up a semifinal berth, and will play the winner of the final round-robin game between Ontario and Nova Scotia. 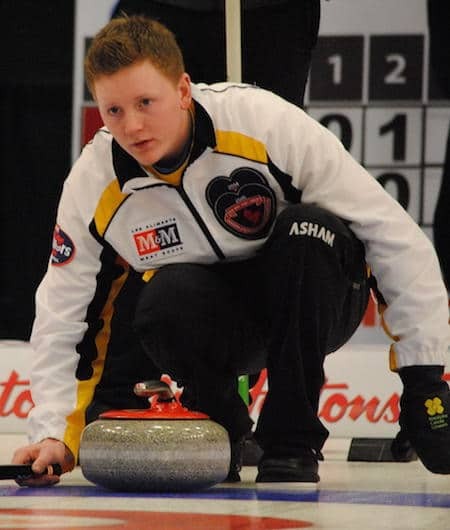 Meanwhile, the defending men’s champion, Braden Calvert of Manitoba (Winnipeg), took another step toward a title defence with an 5-4 victory over Northern Ontario’s Tanner Horgan (Sudbury; 4-5). Manitoba improved to 8-1 with the win, leading the Championship Round standings, and able to clinch a berth in Sunday’s men’s gold-medal game with a win Friday morning against Alberta’s Karsten Sturmay (Edmonton; 7-2). In the other men’s Championship Round game, 2014 silver-medallist Rene Comeau of New Brunswick (Fredericton) improved to 8-2 and guaranteed of a tiebreaker berth with a 7-5 triumph over B.C.’s Paul Henderson (Victoria; 5-5). In men’s Seeding Round play to determine the pool rankings for the 2016 Canadian Juniors in Stratford, Ont., P.E.I.’s Tyler Smith (Montague; 4-4) beat Newfoundland/Labrador’s Greg Smith (Stephenville; 3-6) 10-5. 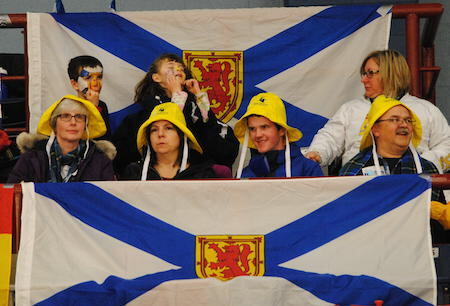 Action at the 2015 M&M Meat Shops Canadian Juniors continues on Friday with the final two round-robin draws, at 8:30 a.m. and 12:30 p.m.
Round-robin games are taking place at both the Corner Brook Civic Centre and the Corner Brook Curling Club. Upon completion of the Championship Round, the top team of each gender advances to its respective final, while the second- and third-place finishers meet in a semifinal to determine the other finalist. All members of the non-playoff teams will compete in a Mixed Doubles competition on Saturday and Sunday. All playoff games will be played at the Civic Centre. The men’s and women’s playoffs will be televised by the TSN network as well as RDS2 (French). The women’s semifinal is scheduled for Saturday, Jan. 31, at 1:30 p.m. NST/noon EST, with the gold-medal game at 8 p.m. NST/6:30 p.m. EST.